You made me cry this morning. You are such a sweet soul, Lisa. I have seen some lean horses around but nothing like the ones you found. It is a bad year as the grass looks like it does after Christmas instead of Thanksgiving. You may have not only saved the horse but helped keep the owners from getting in trouble as well. You have along road ahead, I hope it works out. Lisa, what an amazing opportunity for both of you! I look forward to watching this weak mare transform into the healthy and strong mare that she deserves to be! She will love your forever for what you are doing for her! What a wonderful, loving thing you've done. She looks like a sweet, loving girl. Encouraging, grateful hugs to you! I was getting teary eyed reading the post! You are an amazing person! Francie could not find a better home than with you, Lisa. you are an ANGEL!!! bless you, lisa! Darn it makes me sad. Lisa, you just made my day!!!! Awesome thing you've done, I am sooo looking forward to your progress with Francie... and let me know if there is anything I can do for the others. WOW. You are an angel. Poor thing looks in sad shape, but I bet you have him up and running in no time. I didn't quite dissolve into tears, but I was deeply touched by your care for those horses. I'm not much of a judge of horses, but Francie does look worn down to me. What a kind and generous heart you have Lisa! And more important, I admire your courage in acting on what touches your heart. I've got tears in my eyes and hope in my heart for these horses, and thankfulness that there are angels like you, Lisa, to help the animals. Bless you for taking care of them and doing what you've done. Francie could not have found a better home. There's a similar situation going on in Bedford County. A horse person in the county is trying to raise money to help a family who can't afford (apparently) to properly care for their horses. The animal control people say the people aren't doing anything illegal. At least you have saved one, and shown mercy and kindness to the other two! Oh this post has me in tears. I love your kind heart, Lisa. I'm so glad you rescued Francie and can't wait to hear about your plans for the others. oh lisa, what a heart warming story...your first sentence should have read "grab the tissues"!! a true LOVE story, so glad i didn't miss it!! May Love Always Surround You. O.K., now I am really crying. This is THE best Christmas story I have heard!!! So she is yours now?? you are an absolute angel. You make me think of the song "Bless the beasts and the children, for in this world they have no voice, they have no choice... You are an angel. This is such a wonderful, wonderful thing you did. Keep us posted on how things go! Oh wow! You are some lady! Bless you, Lisa, and the sweet little mare. Sending best wishes for the road ahead. Animals are often utterly helpless and voiceless - what a hopeful post you've shared, thank you! Aww, how sweet! I want to cheer. :) What a wonderful thing to do! Lisa: You have a tremendous heart, and I was very moved by your actions. I hope and pray there is a better place for all of these horses to be evaluated, treated and nourished back to health. Your caring is an example and an inspiration to all of us who stop by here. Tears are welling in my eyes as I read this...so glad you were able to rescue one. I am so happy that you had the courage and ability to help! Lisa I can barely type these words for the flow of tears! This is so very touching...before finishing it, in my mind and heart I knew you would take them home...how could you not! You are that kind of person!! Thanks you Dear Friend for an act of kindness that will give Francie a forever home and the love and care she so desperately need!!! The boys will have a great time too!!! This touches my heart. Such a sweet face, and with you as a guardian angel! Oh, how sweet! Bless you for helping those poor horses! Your story brought tears to my eyes. Good luck! Such a sad story. I'm glad you are there helping out, and you're a super hero in your boy's eye for rescuing the one! What a wonderful person you are. I will send my prayers for these horses. I can understand how some people get into a rough period and can not take care of their animals any longer. I am glad you are there to help these horses. Lisa, you would really like my daughter. She rescued a horse up in Kentucky under the same dire circumstances and now he is well, and lives in a nice stall at a stable. All of my ferrets except two have come from Elizabeth rescues. I am going to send her the link to your blog because I know she will relate to this. you've made me cry, what a sad and yet hopeful story...good luck with the other two...what huge kind hearts you and your family have :-). You are an Angel of God! 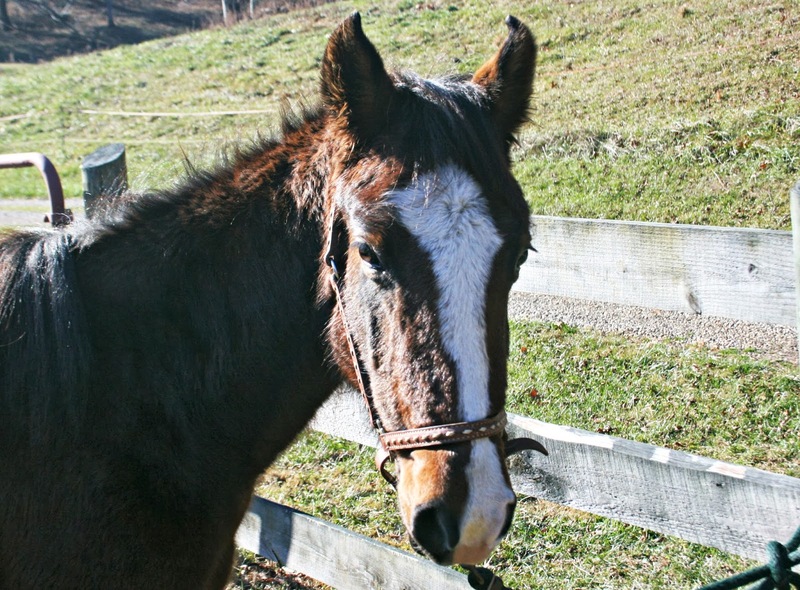 Of course, I'll be back for more updates on this beautiful baby who deserves to live just like the other horses. I think the world may need more people like you, with big hearts to help others in need. You are a real blessing. I am glad to have met you in Blogland, Lisa. God bless your beautiful heart. You are a wonderful soul!!! We could not get this story to open yesterday- so we are back now. thank you for helping the horseys. Wow, Lisa. You are so generous and kind. I look forward to updates. Oh my gosh. Thank you for taking her in! I hope you can help the other two--even if that just means making their last days more comfortable. Maybe you can start a donation for them or something.